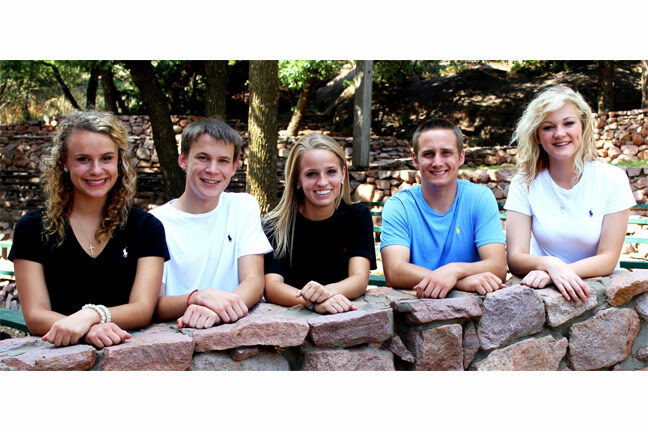 American Farmers & Ranchers/Oklahoma Farmers Union (AFR/OFU) announced its 2013-2014 Youth Advisory Council at the organization’s annual Senior Leadership Summit Banquet July 30. The Council consists of high school juniors and seniors representing AFR/OFU youth from across the state. Members of the 2013-2014 Council are Bethany Harder, Battiest; Ryan Danker, Wellston; Brady Womack, Morris; Brooks McKinney, Spiro; and Megan DeVuyst, Morrison. Council members participate in agriculture-based service projects throughout the year and assist in planning many AFR/OFU Youth Program activities. They also facilitate AFR/OFU events and act as mentors for younger Oklahoma youth. The AFR/OFU Youth Advisory Council is selected at the organization’s annual Senior Leadership Summit. The selection process includes a written application, an interview conducted by a panel of AFR/OFU members and leadership professionals and a speech given in front of the candidates’ peers. In addition to interview and application scores, a vote based on personal relationships is cast by students attending Summit, allowing all attendees to be involved in the selection process. AFR/OFU Senior Leadership Summit develops leadership tools that will prepare high school youth to set and achieve short- and long-term goals. The theme for this year’s Summit was “Lead by Example.” Attendees were encouraged to become involved in their communities and in the lives of others through team-building and cooperation exercises. The AFR/OFU Youth Program provides the youth of Oklahoma varied opportunities to develop into the leaders of tomorrow. The organization hosts a summer leadership summit, a poster contest, an agricultural achievement contest, fall speech contests, statewide scholarships, livestock handling and skills contests, livestock judging and grading competitions and many other leadership opportunities. For more information on AFR/OFU youth opportunities, contact AFR/OFU Youth & Education Coordinator Nikki Slagell at (405)218-5561 or nslagell@afrmic.com.